Behold the Arctopus’ Skullgrid will either leave you in awe of the bands musical abilities or recovering from a throbbing headache. If you do manage to get passed the intense musical acrobatics of Skullgrid you’ll quickly find that there isn’t much left to intrigue you with beyond that. 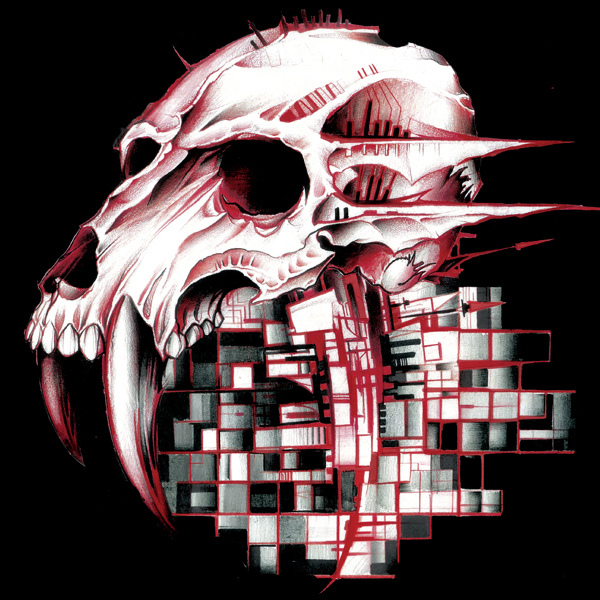 It’s nearly impossible to absorb and remember any of Skullgrid because no part of any song is present for more than a few seconds before it changes into something else. There are some strong moments but they are scattered throughout the album and get lost between the meandering instrumental passages on either side of them. Canada is probably the most coherent song on Skullgrid with the opening segment being repeated a handful of times at seemingly random intervals, making it at least partially memorable. Song lengths vary greatly on Skullgrid with the title track being just over a minute long, You Are Number Six clocking in at 9 minutes and the other 5 songs going from 3 to 7 minutes in length. There is easily enough material on Skullgrid to be fleshed out into multiple full length albums but instead you will hear Behold the Arctopus play every guitar scale, drum pattern and rhythm under the sun packed into a brief 34 minutes. The trio have technical abilities in spades but they would rather show off said abilities instead of crafting a series well thought out instrumental songs. Skullgrid can best be likened to masturbation: self-indulgent, messy and no one else should have to hear about it.